Olga's Eggs-Files. Ukrainian Easter Eggs - Pysanky Egg Art. UKRAINIAN EASTER EGGS PYSANKY BY OLGA. OLGA'S EGGS-FILES. 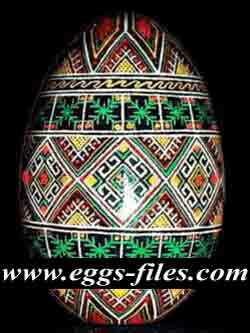 Ancient Ukrainian Egg Art - Pysanky. Decorative hand painted Ukrainian Easter Eggs. Ukrainian Easter Eggs - Pysanky - hand decorated painted eggs / egg-shells, which are made with an ancient wax-resist - wax and dye process. Batik method eggs. All my Pysanky Eggs are blown empty, and have perfect shine - they have several coats of varnish. Ukrainian Easter Eggs (quail, chicken, duck, goose, emu, ostrich pysanky); pysanky supplies, Ukrainian Easter Egg (Pysanky) Books, DVDs; Display Stands for Eggs; Easter in Ukraine(Easter calendar, preparation for Easter, Easter Sunday, Eastertide); pysanky tutorial; the history and symbolism of Ukrainian Easter eggs; carved wooden boxes from Western Ukraine. Ukrainian Easter Eggs. Quail pysanky. Ukrainian Easter eggs. Duck pysanky. Goose etched and carved eggs. Ukrainian Easter eggs. Ostrich pysanky. EASTER Gift! Birthday, Anniversary, New house, Wedding, Christmas, Valentine's Day, New Job!